The Highland Council has been slammed for sending out “mourning kits” in anticipation of the death of members of the Royal Family. 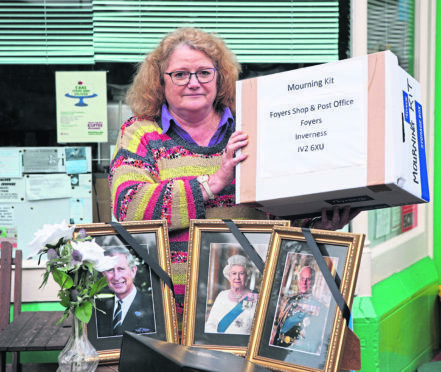 The move was branded “bizarre” by one business owner in Foyers who got the package – particularly as it included materials for Prince Charles who is not yet 70. The kits include a black tablecloth, a vase, a book of condolence and even a guide to mourning. According to a guide to sent out by the Council certain establishments were “chosen” as a designated place of mourning. This included the small post office and shop in Foyers on Loch Ness to the south west of Inverness. The directions state that the book of condolence should be made available on the “first working day” after the announcement of the death. The book should be placed in an “easily accessible place, but discreet enough to enable those signing the books a moment of privacy and quiet reflection whilst doing so. Jan Hargreaves who runs the Foyer’s post office and shop said that she was left quite “puzzled” by the arrival of the package. She said: “I was just surprised. My husband had spoken to someone who called from the Highland Council and then it had slipped his mind. “We were nonplussed by it – just puzzled by it really after all there is being ready and there is this. Plus it is a tiny shop and there is no space. A Highland Council spokeswoman said the move may have been prompted by the Convention of Scottish Local Authorities (COSLA). Duke of Rothesay the Duchess of Cornwall.